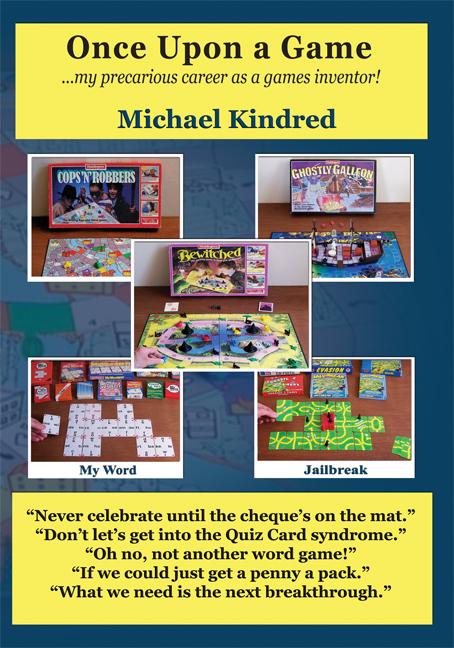 Today I finished reading my friend Michael Kindred’s autobiographical work, ‘Once Upon a Game’, being a description of his ‘precarious career as a games inventor’. For two reasons I am mightily relieved that I can wholeheartedly recommend this entertaining book. The first is because Michael is a very good long-standing friend and, in the world of cryptic crosswords, colleague. The second is that I feature as one of his collaborators. Michael’s capacity to entertain is at least twofold in this piece. The first strand of this talent is in his descriptions of the process of creativity from the, sometimes failing, germ of an idea to the shop shelves. I found his story of how the very successful board game ‘Bewitched’ came into being fascinating and provoking of much admiration. Without giving too much away I can record that his observation of a discarded but saved ‘just in case’ magnet from a kitchen cupboard door mechanism, led to an idea for the game that produced a surprise element that immediately captivated the minds of the Waddington assessors.For those who are intrigued by the actual mechanics of the games; how these developed; the intricacies of the processes of playing; and the rules, there is a different kind of entertainment. I have to confess that my brain doesn’t easily grasp such concepts, so I did skip some sections. If you have a mind like Maggie and Mike’s rather brilliant daughter Cathy, I can assure you that you will be too gripped to skip anything. Super-intelligence is not however necessary for enjoyment of these sections, for Michael does have the ability to make them simple, which benefitted the children at the Southwell primary school where he played a once-weekly play-testing session. I am sure the visits of Mr. Kindred were most popular. The expertise in working with groups, of both Michael and his wife Maggie, was put to good use in the production of the very popular ‘Once Upon a Group’, the first book to come out of the 4M stable. Just as our work on cryptic crosswords and related books involved Michael and me bouncing ideas off each other, so the games creation involved a similar relationship with the late Malcolm Goldsmith. My friend and I shared much fun, as did he with Malcolm. The light-hearted nature of this professional autobiography does not conceal the nerve-wracking aspects of the author’s chosen career. Creativity is an intensely personal process which, as he says, needs the reinforcement of appreciation and acceptance by others. To persevere in the face of the inevitable disappointments requires great courage and resilience. The need to make a living from the products, and their likely short-lived nature, puts timescales on the work which create considerable pressure. The inventor can never rest on his laurels. New ideas must always be forthcoming. The classics such as Scrabble and Monopoly were produced in a different era. I don’t know about Monopoly, but Scrabble was developed as a family game having the benefit of many years’ play-testing before it reached the public. As Michael states, the support of a good wife is also rather helpful. A daughter who loves games is equally a considerable asset.